The emphasis for this trip was predominantly to catch up with friends and family. Though we also squeezed in a two week self-drive exploration of previously unexplored parts of both England & Wales. Some of the highlights from our first few days in the South were the fabulous Bombay Sapphire Distillery, just outside the picturesque village of Whitchurch - on the River Test. The self guided tour here is highly recommended (pre-booking essential) and at the end you'll be rewarded with a custom created cocktail! And a quick stop at Stonehenge - which is always an otherworldly experience. From here we stayed in the Welsh village of Laugharne (home to the famous Welsh poet Dylan Thomas), the seaside town Tenby (so pretty that I took a couple of hundred photos here alone!!) and of course my home town of Abergavenny. Definite highlights in this region were the pilgrimage site of St Davids - home to our patron saint (St David) and a pretty unique Cathedral. As an added bonus, the drive here along the ragged coast was spectacular. The friendly town of Pembroke, with it's magnificent castle. And the little chapel of Saint Govan's - tucked deep in to the cliff side of a sometimes inaccessible Ministry of Defence piece of land. Well worth the trouble to reach it! I achieved a life long dream (nerd alert) of finally visiting Chatsworth House, Derbyshire (home to some pretty amazing characters - and of course some equally amazing gardens.) It didn't disappoint. And neither did the surrounding countryside which was amongst some of the loveliest that we encountered on our whole trip. Luckily our time here coincided with a great exhibition "House Style", featuring five centuries of fashion and adornment at Chatsworth. We were staying in nearby Youlegreave. And of course (being a notorious glutton) made time to stop in at Bakewell, just down the road, for some famous Bakewell pudding. Continuing our journey north we spent some time in the incomparable Lake District. The walks were incredible - and the pub lunches after a just reward! If you encounter a rainy day here and walking is not such an option I could definitely recommend the charming art deco cinema in Bowness Windermere. It's been in operation for over 90 years!! The home (and garden) of Beatrix Potter at Hill Top was a lovely pit stop on the way to Yorkshire. As was Holker Hall - another property belonging to the Devonshire family (of Chatsworth fame.) We stopped there for a lovely lunch in the sunshine, and then an independent ramble around the Hall and gardens. Our base in Yorkshire was the village of Grassington. And I wouldn't stay anywhere else. From here you are easily able to access walks in all directions across the Yorkshire Dales. We took a leisurely stroll from here to Burnsall, a quintessential taste of this part of the country. And it's a good position to access the larger town of Skipton (30mins away) for a change of pace if you've had enough of village life. Again, my nerd factor is in evidence - I got to visit the Haworth Parsonage (home to the Bronte sisters.) Google took us on a rather circuitous (but interesting route) through some nail biting back streets (how these are supposed to accommodate more than one car is beyond me!) Especially at 60 miles per hour. The Parsonage was exceptional and would be a must see for fans and non fans alike - if only for the sneak peek in to Victorian life. I've had Lord Howe on my wish list to visit for many years, and my recent stay more than lived up to expectations. UNESCO listed Lord Howe, located in the Pacific 600 kms east of Sydney, represents the most pristine of Australian Island's with just 320 residents who all work together as conservationists to maintain the unique flora and fauna and the most southern of our Coral Reefs unusual to be found in such a temperate climate, which ranges from 22-26 most days during summer. Just 11kms long and 2kms at the widest point the island only accommodates a maximum of 400 guests at any one time, mostly in 70's motel style self catering accommodation clean and comfortable, but very little choice if something more contemporary is required. The island board of governors insists that the accommodation is discreetly hidden behind foliage dense and subtropical, the Kentia Palm is prolific and a major export for the island, along with stunning Banyan Trees and fragrant Frangipani it reminded me a lot of Hawaii. Old Settlement is the central point of the island with most of the accommodation within easy access of the General Store located here where provisions have been available since 1927 - quite sure nothing has changed here since it opened, an icon. There is also an island co-op manned by locals from 11am until 5pm daily selling locally produced goods, the icecream is highly recommended . Generally food provisions are pricey as the majority of goods are brought in by ship fortnightly and variety very limited getting close to the arrival of the ship. The Anchorage restaurant is open daily for breakfast through to dinner, and also doubles as the island bakery where delicious cakes and breads freshly baked are a highlight and must visit for my daily coffee and muffin - yum! The only other cafe is located within the museum complex, a must visit for a very comprehensive detailed history of the island . What is unique to Lord Howe is that your accommodation offers transport to the various dinner venues at 630pm, and the venue returns you to your accommodation following dinner. This in reality meant we were always home by 9pm. Lord Howe is not for anyone looking for any kind of nightlife, as no street lights, bars or anything other than the Anchorage Restaurant open past 9pm!! The island is stunningly beautiful, especially the green and blue waters of the Lagoon, with the backdrop of Mount Gower, dramatic when the weather changed following a 3 month drought. The locals were thrilled but this stopped our ability to participate in several of the scenic walks as the tracks were muddy and slippery. Transport for tourists is on foot or bicycle- easily hired at a cost of $55.00 for a week and a fun way to get around though our accommodation was at the top of a significant hill - push bike was right!! Settlement Beach and Neds beach were fabulous for snorkelling with Turtle viewing at high tide a highlight at Settlement beach. I participated in a snorkelling /Turtle / wildlife tour operated by Islander Cruises in a glass bottom boat, good value at $60.00 p person for 3 hours. Peter the owner operator was very informative on every aspect of Lord Howe, fishing, sealife, birdlife and politics and fiercely proud of his island. A nice touch was the serving of tea or coffee with his wife's chocolate cake - appreciated after 30 minutes snorkelling and served in a pleasant picnic spot at North Beach. I would thoroughly recommend my choice of accommodation at Earls Anchorage; the complex of 6 large 1 and 2 bedroom villas with spacious living area, large well equipped galley kitchen, spacious separate bedroom with king bed and equally spacious bathroom with shower and the added bonus of a washing machine. Pleasant private outdoor deck and bbq ensured everything necessary for a relaxing comfortable holiday. The villa unit was serviced daily with Twinings Tea and plunger coffee replaced as necessary. A highlight for me was the discovery of Stevens Reserve accessed from our accommodation enabling a pleasant natural bushland walk taking approx 12 minutes to the lagoon and Old Settlement village - once found this was a daily highlight for me. Another bonus of staying at Earls Anchorage is the ability to charge back from the Anchorage restaurant. During my stay I also visited Capella Boutique Hotel, located in a cleared farm area of the island, adjoining the island 9 hole golf course. The views from the restaurant and small infinity pool towards Mount Gower are stunning. Mark, the very laid back manager of the Hotel showed me through the public areas which has a fabulous bare foot luxury feel to it and comes highly recommended. The location near the airport and approx. 15 minute bike ride from old settlement village easy access by the push bikes provided by the hotel for active clients. Capella does not open its restaurant to anyone other than guests. Arajillo is the other luxury Hotel on the island, and arguably in a better location at Settlement Beach, walking distance to the village. 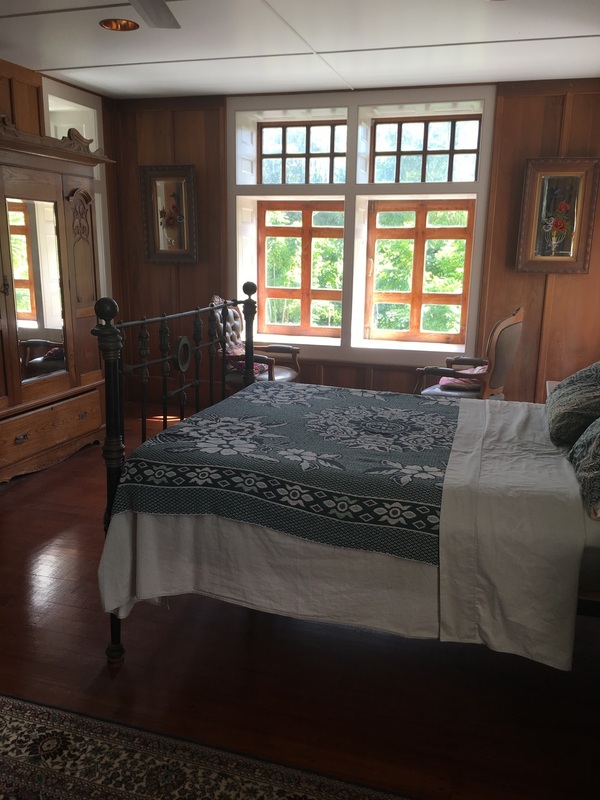 The accommodation is very well appointed however I was surprised at the block of accommodation which detracted from the overall luxury feel of the property. Hidden amongst the dense vegetation too, therefore no views. Arajillo boasts a fine dining restaurant with a 4 course dinner at $95.00 per person. They will take a waitlist for dinner reservations confirmed only if their residents chose not to eat in; known as the best restaurant on the island yet unfortunately I didn't have the opportunity to dine here. Another unique aspect of Lord Howe is the virtually non existent levels of crime! Not any of the properties have door locks - took a little while for me to become comfortable with this before leaving valuables in our villa. There is a police station and the major felony is fining those tourists who don't wear bicycle helmets! Lord Howe is a perfect destination for more active clients who can appreciate the many walking opportunities. Comprehensive maps are available with all walks graded from 1-5 Mount Gower being 5 and only available as an escorted guided walk with an official guide. Families with young children can also enjoy the laid back holiday experience with safe calm waters and little or no WIFI allowing a complete step away from busy lifestyles. Many of the guests return year after year. I spoke with an elderly gentleman who was enjoying his 22nd visit!! Be prepared for delays in travelling here, as the tiny airstrip and small Qantas prop jet aircraft servicing the island is very much weather determined. Often flights can leave Sydney but unable to land on the island and turn around mid flight with an unplanned overnight in Sydney quite common, and extra nights on the island also quite usual to accommodate this. Currently Qantas cover the costs for one nights delay, more than this is at clients own expense therefore good travel insurance is a must for this destination. 32kms doesn't sound like an overly intimidating challenge but the reality of tackling this Great Walk turned out much harder than it had appeared on paper! Though of course it was worth every blister, stumble, scramble and brush with almost catastrophe. It was harder but also incomparably more enjoyable than anything we had anticipated. It started off with a scenic (everything in NZ, particularly the Fjordland region, is scenic) transfer overland from Queenstown, via Paradise (an actual place!!) to the Routeburn Shelter. Day 1 from the Shelter to the Routeburn Falls Hut - was relatively easygoing. You begin a steady climb through a wooded valley, before descending to the valley floor and a vast expanse of grassland. From here it was an uphill climb over rocky terrain to the Hut. They have a lodge up here for the more discerning traveller. We were 'roughing' it in the Hut bunkhouse. Which was clean, comfortable (byo sleeping bags but mattresses are provided) and fully equipped (large communal kitchen area and spotless facilities.) Bookings are required in the summer months, and each evening a ranger addresses that days walkers with an update on weather etc. This took place around 8pm, and pretty soon after we were in bed. Exhausted and gearing up for an early start (to beat the forecast storm.) Note; though our dehydrated meals were light and easy to pack we did look with envy on those (no doubt wiser and more experienced) who had thought to bring along cheese, nibbles and drinks! Day 2 from the Routeburn Falls Hut to Lake Mackenzie - this is where we had our brush with 'catastrophe' (only a slight exaggeration I promise!) The storm was forecast to hit around midday so we were up and out before anyone else has stirred to try and beat it to the pass. The first couple of hours we were treated to some exceptional scenery. So different from the day before, the grassland and forests gave way to a truly wild environment as you navigate the route through the top of the mountains. Unfortunately the storm decided to join us, just as we were making our way along the most precarious bit of narrow mountainside. We took shelter in an abandoned hut (after getting a thorough drenching - we were woefully poorly outfitted for the occasion!!) Fortunately as wild and as quickly as the thunder and lighting had arrived did it also leave. In a break in the weather we had the chance to crawl up to Conical "Hill" (don't let the name fool you!!) This was quite a tricky side-trip. But so worth it for the jaw-dropping view above the clouds. We then scurried down the side of the mountain and took more shelter, as the storm made a return appearance, in the ancient wooded and otherworldly moss covered terrain that sits above the lake - our destination. It's very hard to explain without using the word magical just what this part of the walk was like. We tried to take photos of the hanging moss and lush green trees but gave up after a while as nothing could do it justice. When we eventually stumbled out of here we went straight to bed (to warm up and dry off.) After a few hours sleep, we dragged our exhausted selves outside to be greeted by sunshine and the stunning lake aspect (hidden to us on arrival.) There were about 20-30 other walkers who had joined us by this stage. All with clothes strewn over grass and bush to try and dry them off. We all gathered around the lake to bask in the afternoon sun and later in the dining hall for another early dinner. Day 3 from Lake Mackenzie to the Divide - bliss. This day was almost all on relatively level ground which was a welcome relief after the previous two days. It was another full day of walking, though yet more diverse landscapes unlike any we had yet encountered. By late afternoon we popped out in to the Divide where we were met by our friendly driver for the long journey back to Queenstown. Where we were booked in to a nice hotel for the evening - a well deserved and still happily reminisced about treat after a solid few days of "tramping" across the New Zealand wilderness. I think that this beautiful island paradise is quite possibly Australia's best kept travel secret. There are no locks on the houses, and car keys are left in the ignition... It's the kind of place where you can go to completely escape the hustle and bustle of regular city life. With only 150 residents on West Island, it is a very small and extremely friendly Island. Everyone will come up and say hello, and before you know it you feel like you're part of their community. The locals couldn't be more accommodating, and they definitely run on 'island time'. There's only 1 supermarket, 1 pub; the Cocos Club, 1 café called Maxi's which thankfully has great coffee but closes at 1pm (what was I saying about island time? ), and 1 restaurant, so you're not going to find any cosmopolitan or trendy dining options... but I think that is all part of its charm. With plenty of houses to rent you can easily self-cater for most of your stay if you prefer. It's the perfect beach escape if you want something a little bit different. The temperature is set to a perfect 27 - 30 degrees all year round, and there's no rainy season, so any time of the year is a good time to visit. Cocos has a windy season from July to September making it extremely popular with kite surfers and wind surfers for the reliable weather conditions at this time. There's also fabulous diving and snorkelling opportunities on the many reefs throughout the year. And if you want the crystal clear glass-like water then December and January is the best time to go. The highlight for me was visiting Direction Island or D.I as it's affectionately called by the locals. This is where the water is the brightest turquoise I've ever seen. We travelled over to the island with Geoff on his glass bottom boat, seeing turtles and reef sharks en-route. There's nothing better than dropping the anchor and jumping off the side of the boat to go snorkelling in this environment. A real highlight! You can explore many beaches on the various island's and barely see anyone else, giving you that wonderful feeling of complete isolation - like you're special to be the only ones there. We also did a fab motorised Canoe tour with Kylie and Ash from Cocos Island's Adventure Tours. The early 6am start was instantly softened by a lovely champagne breakfast. The tour took us to the Southern Islands which felt like a scene out of Survivor. More swimming, snorkelling and canoeing resulted in a great morning and one I would highly recommend. Cocos Keeling Islands have an interesting history. From first settlement in 1826, through decades of rule by the Clunies-Ross dynasty, most island inhabitants had little contact with the outside world. The people of the Cocos Keeling Islands voted to become part of Australia in 1984. We bumped into Johnny Clunies-Ross at the Cocos Club who is the 6th generation of his family and now the only family member to still live in Cocos. He was incredibly funny, sharp and a real joy to have a chat with. His love of the island was really evident which he put down to the tight knit community that live there; people are constantly lending each other a hand which is really humbling. Old fashioned community values! The Clunies-Ross family homestead located on Home Island has been purchased by a lovely Perth couple who are restoring the house and now provide accommodation on-site. I would love to stay there to chat to Avril for hours... such an amazing woman with many wonderful stories to tell, not to mention the atmospheric historical surrounds. Virgin Australia fly twice weekly (Saturday & Tuesday) from Perth, with the flight also continuing to Christmas Island (a stay on Christmas Island is also recommended). Due to the flight times, overnight is required in Perth in both directions when travelling from Melbourne. 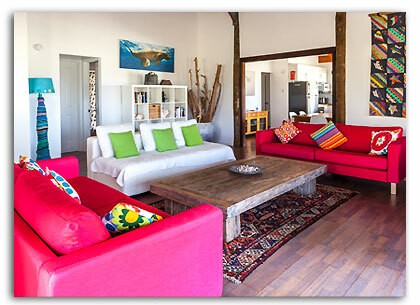 Cocos Homestead; a lovely 4 bedroom, 2 bathroom house that caters to a maximum of 6 guests. Perfect for families or groups of friend's. I travelled Qantas economy from Melbourne and Wellington and was as always very impressed with the Qantas service and their pleasant, friendly crew. Great selection of inflight entertainment and a lovely full lunch served with three options. Very unusual in economy! Business class old style of seat and only first few rows of cabin so arguably not worth the additional cost on this short 3 hour flight. The sector between Wellington and Blenheim was operated by Air New Zealand on a 20 seater prop jet - not for the faint hearted but amazing views of the stunning Marlborough Sounds on this 35 minute flight. A comfortable quick option between North and South Island. Blenheim is a quiet town whose claim to fame is its location in the heart of the Marlborough wine region. Several motels on the fringe of the city square. Our hotel - the D’Urville, named after the French explorer who came here after Captain Cook. Terrific central location housed in the original Bank Trust Building (atmospheric.) With just 11 bedrooms hidden behind enormous original bank vault steel doors which have been refurbished with antique beds, furnishings and a smattering of quaint artwork complete the look. No lift but luggage readily taken to the room by pleasant helpful front office staff. Minimal public areas but pleasant indoor / outdoor bar restaurant area and fine dining restaurant. Excellent menu delicious food and wines. We did find the restaurant service a little slow though. Complimentary port a nice touch for a nightcap! Breakfast was of the continental variety; buffet of fresh fruit, cereals, cheese, cold meats, juice and toast. Adequate and good value at $15 per person. Marlborough Food and Wine festival held at the extensive grounds of Bancroft winery and this event now in its 30th year of operation. 8000 people through the gates and the whole event ran so smoothly. Wonderful wines showcased by the best of the regions Winery's average pricing $3.00 per tasting and $5.00 per glass. Premier Winery's ie cloudy Bay charging more. Full day winery tour operated by Na Clachan Wine Tours. Chris our driver guide provided a terrific full day tour where we visited 8 of the mostly lesser known Marlborough Wineries, with a highlight being Rockferry an organic wine producer where grapes are handpicked. Unusual in this area where machine harvesting is the norm for the Sauvignon Blanc grape variety. The wines were superior to many and the restaurant offered a varied menu with high quality well priced choices. Another highlight was Framingham; delicious wines and this winery offers a free forwarding to Australia service for a purchase of 12-15 bottles. The wine forwarding is offered generally at a cost of NZD80. With the purchase of 15 bottles of your choice from any of the wineries here. Our included lunch was at Alan Scott winery, my least favourite wine tasting but a great restaurant in a pleasant indoor/ outdoor restaurant setting. Our tour companions numbered 6 in the morning increasing to 10 for the afternoon tastings filling the 10 seater mini bus. Like minded group enjoying the tastings and discussions on the various wines. Highly recommended. Gateway to the stunning Marlborough Sound area and point of entry for anyone taking the regular ferry from Wellington on the North Island. Relaxed holiday feel here with plenty of good eating outlets and typical motel style of accommodation. The ferry is used by Hikers keen to walk the Queen Charlotte Track and enables portions of the track to be covered in just one day for anyone not wishing to walk the complete 4 day Trek. Bay of many Coves was the resort I visited, located approx. 40 minutes from Picton Marina, and in my opinion very worthy of its small luxury hotels affiliation. Comfortable one, two or 3 bedroom units immaculately furnished in tones in keeping with the environment and all offering stunning views across the Marlborough Sounds. The resort does not have a no child policy but my general feeling I would not recommend this to those clients travelling with children as the pier access and no beach would be too limiting. The resort has a small restaurant on the pier for day visitors and a private dining room again with stunning views for hotel guests only. I enjoyed a delicious lunch here with a marvellous wine list and boutique New Zealand beers offered to compliment the menu. A 3 night stay here would be perfect for the more active client, enabling a combination of day walks on the Queen Charlotte Track and high quality accommodation, and cuisine to relax in at night Complimentary kayaks included too as an alternative active sightseeing option while staying at the resort. I was fortunate enough to gain a spot on an educational trip to Berlin & Abu Dhabi in December; courtesy of helloworld, Etihad Airways, Air Berlin and Visit Berlin. The features of Etihad's Business class on the Boeing 777 is out of this world! Even with a late evening departure, passengers are able to indulge in a delicious 3 course meal after take-off. You can also enjoy direct aisle access with every seat transforming into a comfortable flat bed for a goodnights' sleep. Pyjamas were provided for the flight with a duvet, pillow and even an in-seat massage function. From Abu Dhabi we travelled on-board Air Berlin's A330, where we were once again lucky enough to secure an upgrade to Business. With a total of just 20 seats in the cabin, it had a very intimate feel and came with similar characteristics to Etihad's Business offering. We were met on arrival at Tegel airport by our chauffeur who whisked us straight on to the Hotel Amano Grand Central. A newly opened 4 Star property located a short two minute walk from Berlin's main train station - Hauptbahnhof. The hotel has a very modern, architecturally designed feel and a number of convenient (and delicious) restaurants on offer. Berlin comes alive at night during the Christmas period - and so we visited many of the Christmas Markets, which feature both gift and food stalls. The atmosphere at the markets were very festive, with all Christmas lighting, decorations and carols - it really got you into the spirit of the season! On our first full day in the city we visited the Berlin Wall – a devastating reminder that the East and West of Berlin was quite literally divided between 1961 and 1989. Also not to be missed is the interesting Story of Berlin Museum, the Brandenburg Gate - an 18th century triumphal arch in Berlin and one of the best known landmarks in Germany, the Reichstag building, and the East Side Gallery - which was probably one of my favourite spots. This is where artists express their sense of freedom in the form of graffiti on the eastern side of the Berlin Wall. Transport in Berlin is extremely easy. We travelled extensively around the city using the Berlin Welcome Card – a travel card, but not your average MyKi Card like we use in Melbourne! It is a pre-paid travel card which you can purchase for nominated days and enables free travel with all public transport services and includes discounts at over 190 speciality restaurants and shops around Berlin – great value and highly recommended! My highlight of Berlin was the "Gastro Rallye Night Tour" an exquisite food tour of different Berlin culinary hot spots with a course taken at three restaurants. We walked to each restaurant between courses; which helped somewhat to work off the food and wine consumed! Next stop - Abu Dhabi! The flight back was very crowded and long. We arrived in Abu Dhabi to extreme heat, the very opposite of Berlin which was very cold! Abu Dhabi airport is huge and still under construction as they are building another Terminal. If staying in Abu Dhabi prepare for very long wait times to get through customs! Finally we got through and we were met for transfer to our gorgeous hotel, the Dusit Thani. A 5 star luxury hotel located in Abu Dhabi's new business district, near the Eastern Mangroves and the Corniche. The hotel has a very Thai theme to its decor and presents a very fresh and innovative design. My room was spacious and had spectacular views. When in Abu Dhabi you can’t miss the Sheikh Zayed Mosque - a grand palace of worship. You’ll also most likely visit the Corniche (a pristine waterfront stretch featuring its own beach, many hotels, restaurants and cafes), Yas Island (a man-made island which can be reached by air, sea or road. It is home to Yas Island Marina GP Circuit, Ferrari World (an amusement park) and Yas Mall (one of the largest shopping malls in the world). Another attraction that really can't be missed is the Desert Safari Experience (a 4x4 Jeep drive in the desert sand dunes, a camel ride and wearing native costumes) and Sea Wings (a scenic flight over the city of Abu Dhabi). These 2 were the highlight of my time here! While at Yas Island we inspected the Crowne Plaza, which is a family friendly 4 star resort located next door to Yas Links Golf Course and features spacious rooms with many interconnecting which are great for families, many restaurants and bars, pools and a great kids club. Back to work again; we visited the Etihad Airways Innovation Centre - and WOW was this spectacular! This state of the art facility is home to a walk-through reconstruction of the new A380 and B787 aircraft cabins, which also includes a real life model of the much talked about 'Residence by Etihad' (a luxury living space in the air with its own living room, ensuite bathroom and separate bedroom. Passengers are able to also take advantage of being privately served by their own butler and in flight chef), First Apartments and First Suites (a spacious living area with a shared bathroom and 5 star dining in flight chef). I relished that moment as this was probably the only time I would ever get to experience these facilities! For our last night in Abu Dhabi we were fortunate enough to inspect and dine at Jumeirah at Etihad Towers which was a lovely and memorable way to end our journey. I thoroughly enjoyed every moment spent there and although this is seen as a stopover destination, I found that there is so much to see and do, that a quick trip is just simply not enough! This was actually my first time in Bangkok. I'd previously by-passed the bustling capital to head straight for the southern beaches, so it was great to finally visit. The trip was capped off with a stay at the stunning Banyan Tree Phuket to rekindle my love of Thai Resorts. I love arriving in a new destination at night when it's dark, because you have the excitement of waking up the following day to see a new place for the very first time. My very early jetlagged wake-up time of 4am therefore didn't bother me, as I pulled back the curtains in my suite to watch an amazing sunrise over the river. A pretty nice intro to this buzzy city. My room was up so high that I could even watch the birds flying past my window. It was a fairly brief stop in Bangkok but we managed to fit in some sightseeing of the main highlights; the Grand Palace and Wat Pho. The Grand Palace would be one of the most visited sights in Bangkok and the day we were there certainly was no exception, the place was packed!! We managed to meander through the crowds and learn about the history of Thailand whilst appreciating the unique architecture. 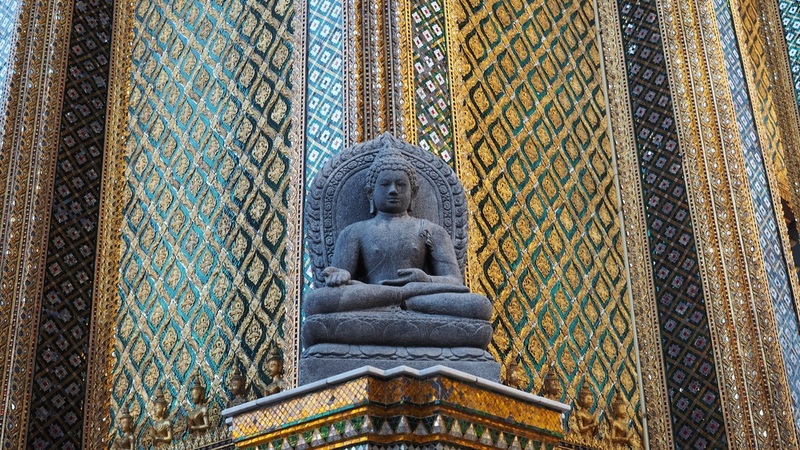 Next stop was Wat Pho; the oldest temple in Bangkok to see the giant reclining Buddha. We drove through China Town which reminded me of the streets of Hanoi. I'd love to go back and walk around explore the area on foot. A gorgeous 5 star city hotel. I stayed in the Serenity Club Suite room category which have all recently been renovated. The rooms were extremely spacious and contemporary, with a heavenly bath which was the perfect place to relax after a day of sightseeing! The highlight for me was alfresco dining at Vertigo, on the rooftop of Banyan Tree 61 floors above the bustling streets of Bangkok. The view was amazing. You know you're up high when most of the buildings are below you. A gorgeous all-villa 5 star resort in the Laguna area of Phuket, far from the hustle and bustle of Patong Beach. This is the resort you want to go to for some luxury, pampering and relaxation. Our 2 bedroom private pool villa could comfortably accommodate a large family or two groups of friend's. The resort provides really cute, vintage bicycles to hotel guests which are used to get around the large resort grounds - the perfect way to arrive at breakfast in the morning, or make your way to the beach. Oh the beach... my favourite place - Banyan Tree guests have access to a pristine stretch of beach which was so peaceful and quiet, it was the perfect place to relax and truly escape. We also did an inspection of the more family-friendly sister property Angsana Resort. This resort is fab for families and younger couples with loads of activities available and a very cool beach bar 'Xana' which has a great vibe throughout the day. We flew on the Dreamliner and I was really impressed with the on-board comfort. Very generous legroom in economy and top service! I also love the window design - there's no shutters, but instead a button to dim the windows to block out light so you can still see out the window, whilst reducing the glare on the screen at the same time. Genious! The one draw-back of no alcohol being served on-board was easily avoided by taking our own supply on-board (and yes we did feel a bit desperate pulling out the bottle of alcohol to pour ourselves haha). You just have to make sure you purchase it duty free AFTER you've gone through the security check-point otherwise it will be taken off you. Business class was equally impressive with fully lie-flat beds, although the lack of premium alcohol on-board did taint the experience somewhat. Being served a welcome drink of fruit juice didn't quite have the same effect as a nice glass of French Champagne! For value and comfort I'd still give Royal Brunei Business a 10/10. As a pair of twenty somethings, we’re probably not the target age range to be considering a cruising holiday. But when given the opportunity we jumped at it. And I’m so very glad we did. We arrived at the port (Yokohama) by train from Tokyo central just in time to grab a quick bite to eat (sushi, of course) on the waterfront and admire the ship before boarding. It was a hot, humid day and unfortunately we didn’t get much of an opportunity to explore Yokohama (a city of 3.7 million people, once the largest suburb in the world until it was incorporated in to Tokyo) before we had to join the throngs and complete embarkation. This was done in the recently completed Yokohama port terminal. An impressive architectural building, with vast swaths of grass across its sinewy roofscape. There was a fair amount of waiting around whilst the hundreds of people passed through security and had their passports and paperwork checked. We were able to hand over our luggage at this stage so at least we didn’t have to lug that around as well. Tip – make sure you have all your baggage labels printed off and don’t leave your passports etc in your main bag as you will need all of this to get on the ship! At the gangplank we had our security photo taken and were handed our access cards (which act as your room key / shipboard account / and allow you to pass on and off the boat when in port with ease.) Then it was on to our room where our bags were waiting and we were greeted by our room steward, the lovely Nazario. Then it was time to wander and get acquainted. The Sun Princess carries 1,998 passengers and 924 crew – so its size is impressive, yet not overwhelming. Our first stop was the three storey atrium which acts as the heart of the vessel. A sake ceremony was in full swing when we arrived so we had at least three cups from the sake barrel before making our way to the upper deck to wave goodbye to the band playing us out below. Passing beneath Yokohama Bridge was a highlight that evening as we relaxed in the roof top spa. I can definitely see the advantage of a balcony cabin when cruising interesting coastline or of course for the obligatory pre dinner drink. But I would not discount the option of an interior cabin if you want to keep the costs low or you think you might be spending most of your time outside of the cabin anyway. The itinerary for our Japan cruise was one which Princess are currently trialing. We were able to visit some interesting ports with a focus on Hokkaido and a brief foray in to Russia. We traveled in the height of the Japanese summer so in Tokyo it was stifling and humid. As we moved up the coast the temperature dropped to the mid-twenties (and in Russia the weather became quite overcast and cool.) Hakkodate was the standout port town for me. Though our day in Sapporo was a close runner up. We did a few of the shore tours organised by Princess. On the whole we felt these offered great value for money. And were so efficiently organised that you never had to worry about racing back to the ship or missing any of the key sights in what can be quite a tricky country to navigate by yourself. In Sapporo we took the ship operated transfer in to town which also offered some fantastic commentary from a delightful host as we drove for 30mins in to the city. I think this tour, as an example, cost $20 each. And gave us a really interesting insight to the city that we would not have got if we had taken the train there by ourselves. Not to say you always need to go with the organised agenda. In a lot of cases we just walked off the ship and went for a wander around. There was always an enthusiastic group to welcome us and hand out local maps and tips for what to do. As well as some awesome traditional bands which seemed to be out in full force wherever we went! Naturally, they have a fully equipped gym with all the latest equipment. A spa (which sadly, I didn’t get to try out) and many many other activities to keep yourself entertained. A benefit of a larger cruise ship for any itinerary that spends a couple of days at sea in any given period of time is the endless array of things to do. And it never felt overcrowded. Staff knew our names after the first few days and would greet us with a smile and a cheery hello. Getting on and off the ship was a simple process involving no queues, a flash of your key card and a quick scan of any bags through security. The only instance in fact where we had to wait was the one day we used the tender service to get ashore. This was in Russia and the only reason this was less than straight forward was the Russian authorities taking forever to process all the necessary passports and visas. No real way to get around this I’m sure and not a big inconvenience. We were always kept abreast of what was happening and they were most effusive with their apologies. When disembarking there are various options to choose from. You can leave you bag for collection the night before. And then when you disembark it will be waiting for you at the pier. We chose to take our bags off with us. This meant we were first to leave, and so long as you can manage your own cases up the gangplank I think this was definitely the way to go. No hustling over bags etc at the busy port terminal. We just stepped right off. After this trip I can safely say we’re definitely a converted pair of avid cruisers. Would we do it again, we’re already booked for our next one and can’t recommended it enough!! If you’re keen on a completely stress free getaway. Visiting some amazing places. And all the while in incredible comfort, with food and and drinks and things to do everywhere you turn! Then you should definitely give it a whirl. Whilst here I stayed at the Fairmont Hotel; excellent location for a stay in Abu Dhabi, 20 minutes from the airport and the Grand Mosque clearly visible from the hotels private beach. Huge comfortable rooms, separate glassed door to the bath and shower with deep deep bath! Wifi is charged at DRM75.00 for 24 hour access, complimentary to Fairmont loyalty club members. Spacious contemporary styled foyer, 4 permanent food and beverage outlets and the summer tent still in place on the beach, erected for use during Ramadan and open for dinner only. Without question the highlight of a visit to Abu Dhabi is the Grand Mosque. Stunning White Marble structure which stays remarkably cool in the scorching sunshine. To visit the Mosque it is mandatory for woman to have their bodies covered completely with hair also completely contained by a scarf or the black clothing provided by the Mosque to use on entry if western clothes considered unsuitable. Friday is the Holy day and the mosque is closed to visitors. Iconic hotel, which I was fortunate enough to be able to visit during my stay. Huge impressive foyer and public areas - all the gold in the decor is actually gold leaf, and is constantly being refurbished to keep the hotel in its original splendour. Quirky speciality of afternoon tea here is that the cakes and coffee is sprinkled with 18c gold flakes. The hotel is one kilometre between the west and east wing, where the 384 bedrooms are located. The impressive circular balcony accommodation above the public rooms are all suites, reminiscent of a splendid theatre. Spacious outdoor pool area, large private beach, private Marina where guests often arrive in their private yachts.